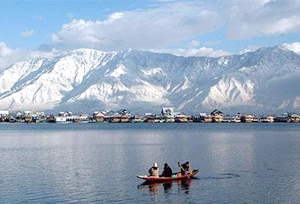 Nishat Garden: Located on the bank of the Dal Lake, with the Zabarwan Mountains as its backdrop, Nishat Bagh is a garden of bliss that commands a magnificent view of the lake beneath the snow capped Pir Panjal mountain range that stands far away to the west of the valley. The Bagh was designed and built in 1633 by Asif Khan, elder brother of Nur Jehan. 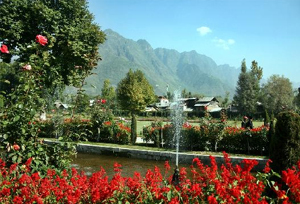 Shalimar Garden: The Shalimar Bagh is the celebrated royal garden of Kashmir. The Emperor Jahangir was so fascinated with the garden that he called it "one of the sights of Kashmir." Cheshma Shahi: Cheshma Shahi (the royal spring), also called Cheshma Shahi, is one of the Mughal gardens built around a spring by Ali Mardan, a governor of Mughal emperor Shah Jahan, in 1632. The garden is located in the Zabarwan Range, near Rajbhawan (Governor's house) overlooking Dal Lake in Srinagar, Kashmir. 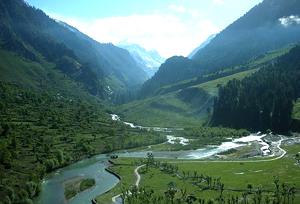 Betaab Valley: Betaab Valley is a very famous tourist spot situated at a distance of 15 kilometers from Pahalgam. The valley got its name from the Sunny Deol-Amrita Singh hit debut film Betaab. The Valley is towards northeast of Pahalgam and falls between Pahalgam and Chandanwari and is en route Amarnath Temple Yatra. 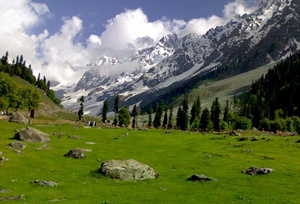 The valley surrounded by lush green meadows, snow clad mountains and covered with dense vegetation. Aru Valley: Aru is located around 12 km from Pahalgam, 11 km upstream from the Lidder River. Noted for its scenic meadows, lakes and mountains, it is a base camp for trekking to the Kolahoi Glacier and Tarsar Lake. The village lies of the left bank of the Aru River, which is a tributary of the Lidder River. Chandanwari: Chandanwari is situated 16 km from Pahalgam, Chandanwari is the starting point of the Amarnath Yatra, which takes place every year in the month of Sawan (Rain). It is famous for snow sledging on a snow bridge. Gulmarg Valley: Gulmarg literally means Meadow of Flower Gulmarg is located 60 kms away from Srinagar is an 1:30 hrs of drive by car. 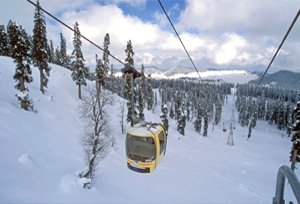 Gulmarg has attracted million of tourist throughout its existence with the scenic beauty of Himalayan Mountain in the back drop one of the main attraction in Gulmarg is the Gulmarg Gondola.